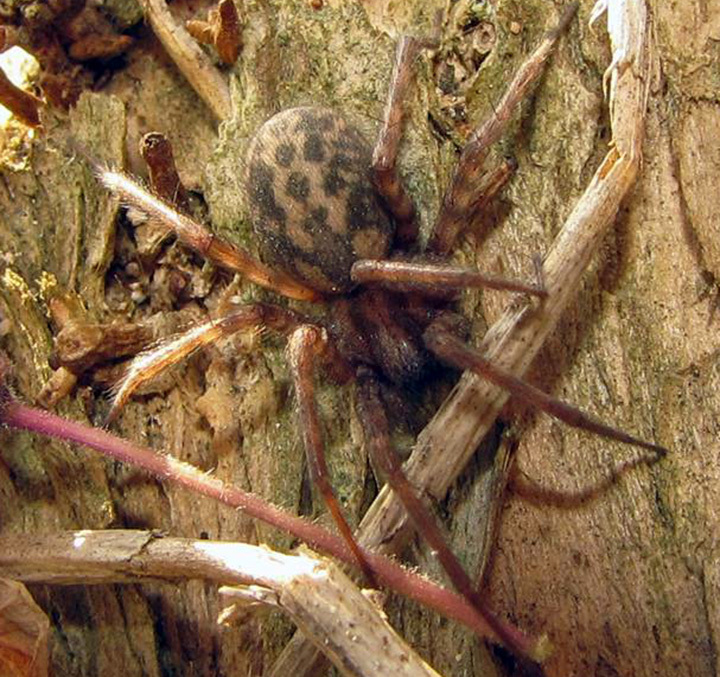 Agelenids are medium-sized spiders found worldwide, mostly in the northern hemisphere. In Australia only one species is known, the introduced Tegenaria domestica, which is a large but uncommon house spider. Australia appears to have no native Agelenids, even though Oramia frequens was described by Rainbow from a female on Lord Howe Island. It is most probably a misidentification and may be impossible to verify. In Europe Tegenaria domestica is one of the more common and obvious house spiders. Agelenids are mostly grey to brown with eight eyes in two rows, the rear one wider, the front row slightly curved forward. Spiders in this family are notable for their speed, especially on the web. They have cribellate wavy or woolly silk, produced from a disc-like organ near the spinnerets, which doesn't have the same strong adhesive properties of the silk used by most araneomorphs. Tegenaria domestica is possibly more easily recognised by its web than by the appearance of the spider, being nondescript. Its web is often built into the corners of rooms, with the retreat tucked into the crevice above. It is known as the Barn Funnel-weaver in North America and the Domestic House Spider in Europe. It may have been introduced to the Americas by British lumber merchants during the Napoleonic Wars era but it's possible it spread to the americas long before that. It is dark orange to brown, beige or grayish with striped legs and two dull-black, stripes running lengthways on the cephalothorax. The abdomen is mottled in brown, beige or grey and has a pattern of chevrons. It usually moves in short bursts, stopping before deciding where to head next especially in the vicinity of prey or threat. 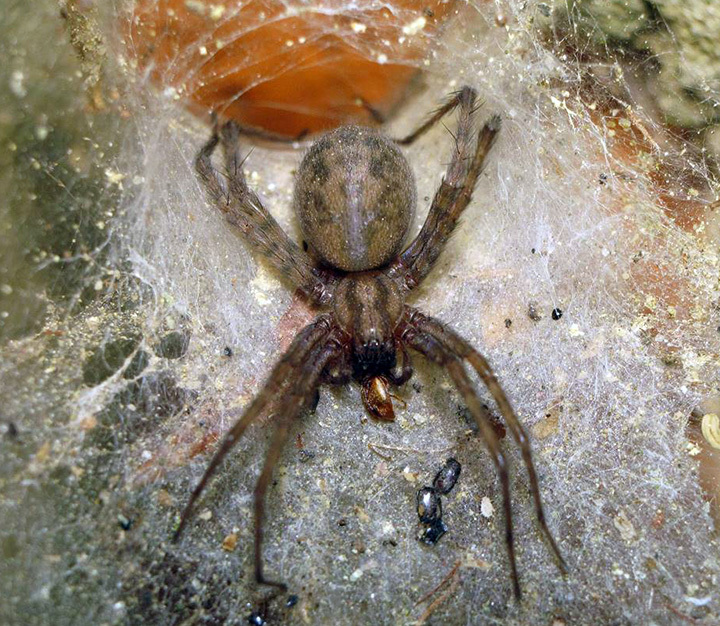 Females usually live for two years (and occasionaly much longer) on the same web inside houses but don't survive cold winters outdoors. Tegenaria domestica is not particularly aggressive, usually retreating when confronted. If the web is attacked and partially destroyed, the spider will attempt to flee the area or may huddle its body into a ball against the wall. Tegenaria species rarely bite. If they do, the bite is painless. ♀ 13mm ♂ 12mm. Photo: Richard Louvigny via Ed Nieuwenhuys.